A higher retirement age, fewer cost-of-living increases, and lower taxes could be part of Social Security reform if new proposals advance on Capitol Hill. As recently as December, a new plan to improve the solvency of Social Security was introduced by Republican Congressman Sam Johnson, chairman of the Ways and Means Social Security Subcommittee. 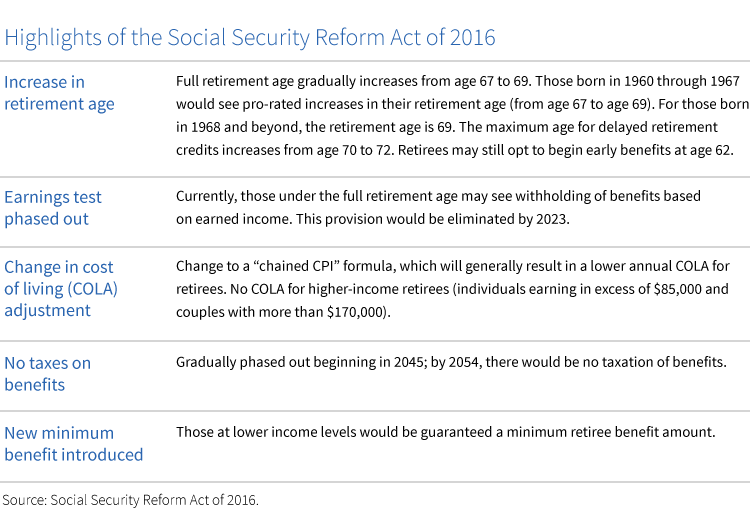 The Social Security Reform Act of 2016 (HR. 6489) would impose significant changes to the system. The plan includes some elements of earlier proposals as well as many new ideas. According the latest Social Security Trustees Report,the trust fund’s reserves would be depleted by 2034, at which time recipients would face an approximate 25% reduction in benefits. Over the past decade, there have been numerous proposals to reform the system. For example, reforms were included in the recommendations in the 2010 Bowles-Simpson deficit reduction proposal. Increasing the retirement age has been a common theme of many proposals, including the recent bill. One key difference between this proposal and earlier versions is that it does not include an increase in the Social Security wage base for determining payroll taxes. Currently at $127,200 for 2017, other proposals have called for an increase in the wage base to approximately $200,000 — or in some cases $250,000. Given that the system has not seen a comprehensive overhaul since 1983, one could argue that Social Security is overdue for major change. However, any proposal to radically alter Social Security will likely receive significant opposition from various interest groups and require at least some level of bipartisan cooperation. Still, given Social Security’s current financial trajectory, those born in 1960 and after should consider the risk of reduced benefits in the future when planning for income in retirement. Most people will include Social Security as a source of retirement income. Today, more than 38 million Americans receive benefits. An advisor can help investors determine the optimal time to claim benefits and monitor potential changes in the system.